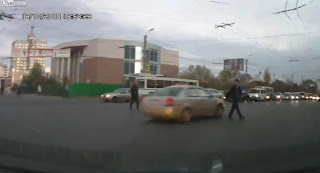 The lights turn green and up the road, there are some pedestrians crossing the road. Do you slow down or try to avoid them by speed through? Well, just ask this Russian driver as he weaved through two pedestrians who were crossing the road.